When it comes to history, few cities compare to Charleston, South Carolina. For decades the city’s rich culture and history have drawn visitors worldwide to the charming city. These days, add cruising to the list of reasons to visit Charleston. 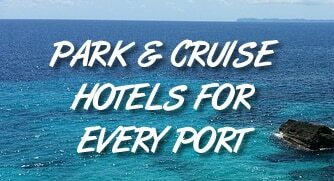 Today you can sail year-round from the port city, with trips headed to Bermuda, the Bahamas, and the Eastern Caribbean. Trips range from 4-day getaways to 10-day tours with stops in St. Thomas, St. Kitts, and San Juan, Puerto Rico. If it’s your first time sailing from Charleston, you likely have a few questions about your cruise… how to get there, where to park, where to stay, and even more. So to help you get started, we’ve covered the basics of the port to give you a better idea of its location and layout. The links below should also help you answer some of the common questions about sailing from the port. The cruise port is situated near the southern tip of Charleston, almost directly across the river from Patriot’s Point and the USS Yorktown. The terminal sites about 12.5 miles from the Charleston International Airport (about a 25 minute drive). If coming from points further, the port is roughly two hours drive from Savannah and 4.5 hours from Atlanta. Charleston has only one cruise terminal, which makes it easier to navigate on cruise day than busier ports in Florida. Parking is near the cruise terminal, but a little far to walk. For convenience there is a shuttle that runs from the parking lot to the cruise terminal. Cruise Lines Served: Carnival (Embarking/Debarking); Other lines have Charleston as a port of call.